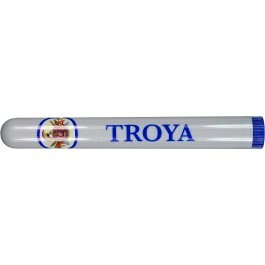 The Troya Coronas Club Tubos is an accessible machine-made Habano, with 38 ring gauge, 5.3” (134mm) long and comes in plastic tubes in packs of 15 cigars. • Not overly complex, it still has enjoyable sweetness and dark leathery/musky notes. The Troya Coronas Club Tubos comes in plastic tubes in 5 cardboard packs of 3 cigars with Habanos packing code D-C-C/P-3-P/T-15. The wrapper is looking good, a bit toothy. The cigar is using short filler and is precut. At cold, the draw gives some cedar notes with some nice honey sweetness. The draw is good. Once lit, the Coronas Club is generating lots of smoke. Lots of woodiness but no harshness at all. There are also some delicious sweet cherry flavor. Body at a mild-to-medium. Some strength shows up in the middle third, but the sweet cherry flavor takes over. The body is at a medium level now. Some powerful sweet spices join the mix. However, despite the constant sweetness, the strength increases again. Deep woodsy flavors and musky notes are coming to foreground in the last third. In summary: an affordable Cuban smoke that is accessible yet always remains interesting.